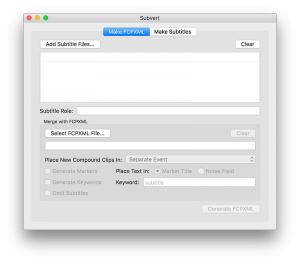 Subvert makes editing with subtitles in Final Cut Pro X easy and powerful. It brings subtitle files into Final Cut Pro X so you can edit with subtitled footage or add subtitles to project timelines. It also gives you the ability to pull subtitles out of edited projects so that you instantly have subtitle files for final delivery. Subvert is an end-to-end subtitling workflow, perfect for foreign language and documentary projects.